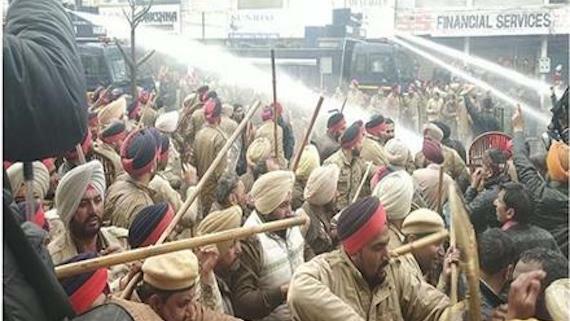 Patiala, Punjab: The Punjab police on Sunday (Feb. 10) resorted to lathicharge on teachers who were trying to gherao the resident of Punjab CM Amarinder Singh. Teachers are protesting against massive salary cut imposed by the Punjab government under its regularisation policy for 8,886 teachers of Adarsh schools, Sarva Shiksha Abhiyan (SSA) and Rashtriya Madhyamik Shiksha Abhiyan (RMSA). In wake of gherao call by teachers the Punjab police had barricaded the road leading to Amarinder Singh’s residence. The teachers forcibly remove the barricades as they tried to reach close to CM’s residence. The police then resorted to lathicharge to disperse them. The police also used water canon. Media reports say that around 11 persons, including some cops, were injured in this clash. The District administration later called the teacher leaders for talks and promised to arrange marriage with education minister OP Soni on February 14 and another meeting with Chief Minister on February 28. Harpal Singh Cheema AAP MLA and Leader of Opposition said that had the state government accepted the demands of teachers, the situation of confrontation between teachers and police would not have occurred. He said that Congress government was adopting path of confrontation. He demanded to fulfil demands of teachers and other sections of employees. Former Deputy CM Sukhbir Singh Badal has criticised the Punjab government for police action on protesting teachers. It is notable that the rule of Sukhbir Singh Badal’s party in Punjab during 2007 to 2017 was not better in this regard. During SAD (B)-BJP rule in Punjab, even some leaders of Sukhbir Singh Badal’s party had themselves manhandles female teachers who were protesting to get their demands fulfilled.